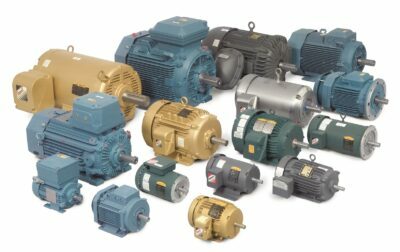 In addition to pumps, blowers, and heat transfer equipment, Kerr Pump & Supply can also furnish industrial electric motors – general purpose and induction – to meet all your EISA Compliant needs. 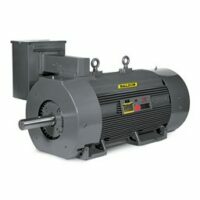 These motors can be purchased separately or as part of a total packaged pump system. Motors are shipped in one day. Not familiar with some of these terms. We’ve included a handy reference for you below. Brake Motors – An electric brake motor can make an electric motor turn backwards. The motor brake supplies the electric motor with an external force. It is usually applied by the wheels of the car that generate electricity. C-Frame motor – has a C face or flange mounted motor. It is the most popular type of face mounted motors and has a specific bolt pattern on the shaft end for mounting. The main distinction of C face motors are the bolt circle, register, diameter, and the shaft size. They also have threaded mounting holes. Close Coupled Pump Motors – use an impeller as the main element of the motor component. The pump doesn’t have a separate coupling, which eliminates coupling alignment that could be more time consuming and expensive. Air Motors – does mechanical work by expanding compressed air. It converts the compressed air into mechanical work by either linear or rotary motion. Linear motion comes from either a diaphragm or piston actuator, while rotary motion is supplied by vane type air motor, piston air motor, air turbine or gear type motor. Washdown Duty Motors – used in food processing and other uses where the motor is routinely exposed to washdown, chemicals, moisture and humidity. Washdown motors provide durability and flexibility to help maximize uptime and reduce overall operating costs. Automotive Duty Motors – are ideally used for a variety of tough applications found in automotive manufacturing facilities and other industries utilizing U-Frame motors, that include pumps, conveyors and fans. Vertical Solid Shaft and Hollow Shaft Motors – designed to drive vertical turbine pumps. There are two types solid shaft and hollow shaft. The solid shaft is coupled to the pump shaft by externally mounted coupling. 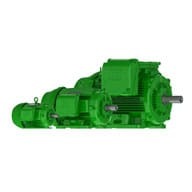 The hollow shaft motors allow the pump head shaft to extend through the motor shaft and connect to an integrally mounted drive coupling. A hollow shaft has easy impeller adjusting also. P-Base Motors – suitable for dusty or moist environments and provide high starting torque, with efficient performance. Used in normal thrust in-line pump applications. Brushed DC Electric Motor – provides precision control of speed, driven by a direct current. It has the potential to supply three to four times more torque than it is rated for without stalling. It offers stable and continuous current. These types of motors are commonly used because of there ability to vary the speed-torque ratio in almost any way. 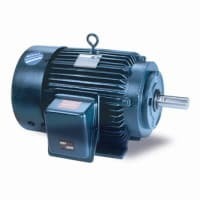 AC Motors – consist of two basic parts, an outside stationary stator having coils supplied with alternating current to produce a rotating magnetic field, and an inside rotor attached to the output shaft producing a second rotating magnetic field. They are widely used for pumps, blowers, conveyors and other industrial machinery. Synchronous Motors – where the connection to the rotor of a three-phase motor are taken out on slip-rings and fed a separate field current to create a continuous magnetic field. It also has the rotor rotate synchronously with the rotating magnetic field produced by the polyphaser electrical supply. 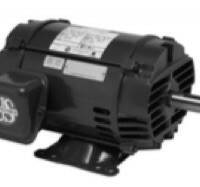 Variable Speed Motors – allow you to easily change the speed of the rotation of the motor. A TEFC or Totally Enclosed, Fan Cooled motors has an enclosure that does not permit outside air to freely circulate through the interior of the motor. An external fan blows outside air over the frame of the motor to cool it. Most commonly used motor for normal industrial environments. They offer increased protection against weather, dirt, and moisture. A ODP motor or a Open, Drip Proof motor are relatively inexpensive motors used in normal applications. It consists of a sheet metal enclosure with vent stamped to allow good air flow. The vents are designed in such a way that water dripping on the motor will not normally flow into the motor. A fan is mounted on the motors rear shaft to pull air through the motor to keep the motor cool. Explosion Proof Motors- able to contain any explosion originating within its housing and prevents sparks from within its housing from igniting air surrounding it. It does not mean it can withstand outside explosions. Severe Duty Motors – improvement over a TEFC motor. A severe duty one is tougher and better suited for an industrial environment. Good at dealing with airborne contamination or undue mechanical stress. IEC Motors – These types of motors meet the standards of the IEC International Electrotechnical Commission. It specifies energy-efficiency classes for single speed, three phase and cage induction motors. Energy Efficient Motors – use less electricity, run cooler, and usually last longer than other motors of the same size.